Software can be great. It can solve the problems you face. It can be both fast to learn, and easy to use. It can be affordable. At OffByZero that's the kind of software we create. We're passionate about making great software, and helping others to succeed. We offer a wide range of services including custom software development, training, and consulting. Our Practical Extreme Programming course will provide your developers and project managers with real Agile experience to bring to your organization. 2010-06-24 - Introduction to Digital Signing of Content - A step-by-step guide to digitally signing your posts and emails. 2010-06-24 - Developing for Software Protection and Licensing - Discusses how to develop software with protection and licensing in mind, and what features to look for in a third-party solution. 2009-10-26 - Reciprocal Relationships using ActiveRecord - Explains how to model reciprocal relationships using the ActiveRecord ORM in Ruby on Rails. 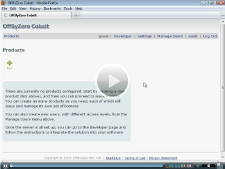 OffByZero Cobalt allows you to focus on your core product development. You can avoid the difficulties of building a software activation solution with copy protection, be up and running in minutes and protect your intellectual property with one system. OBZVault 3.3 is a cross-platform encrypted text editor. With OBZVault you can secure sensitive information like passwords and quotes on Mac OS X, Windows, and Linux.